A Visa is an official permit to enter, pass through, or remain in the country for a certain period of time. Every traveler from a non-CIS country (Commonwealth of Independent States) and some other countries must possess a valid visa to visit Russia. Russian visas are classified according to the number of entries: a single-entry visa, a double-entry visa, a multiple-entry visa. 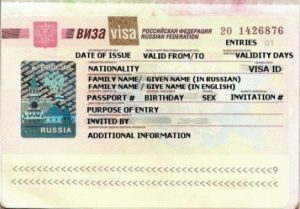 Depending on the purpose of entry in Russia, ordinary visas are categorized as private, business, tourist, educational, working, humanitarian (for a scientific, cultural, political or a sport visit, religious communication, charity, delivery of humanitarian aid) and entry visas (for receiving shelter or to obtain citizenship). A private visa is issued for a period of up to 3 months (single or double entry) to foreign citizens traveling for a short visit on the basis of an invitation letter. It is convenient if you have friends or relatives in Russia who can host you during your trip. This type of Visa can take from 45 days to four months to obtain. A business visa is issued for a period of up to one year (with single, double or multiple entry) to foreign citizens traveling for a business trip on the basis of a business invitation from a Russian company. The invitation usually takes 20 working days to issue. Visitors are restricted to a maximum of 90 days in a 180-day period when using a multiple entry visa. An original HIV Certificate showing a negative result is required for stays of over 3 months. A tourist visa is issued for a period of up to one month to foreign citizens traveling as tourists, if they hold an invitation letter, received from tour operators, hotels, or through various online services. It is the cheapest and easiest to obtain. Single or double entry visas are available for a maximum stay of 30 days. All types of Russian entry visas can be received through Russian embassies and consulates; the process usually takes 14 days. A transit visa is required when you travel through Russia to another country without staying in Russia. No invitation is required, but you need a copy of the ticket and a visa to the country of destination. For flight travelers, a transit visa is issued for 72 hours. For transit by car the maximum validity of a transit visa is 10 days. Children, who are listed in parents’ passport and travelling with them, do not need a separate visa. If children have their own passports, a separate visa is required. Russian Tourist Visa requirements: original passport with at least one blank page, valid for at least 6 months after the end of your stay, 1 photo (color, matt, 3 x 4 cm), an invitation, Russian Consulate Application Form (printed on A4 paper with right and bottom margins of 5mm). Some embassies require a photocopy of the details pages of your passport in addition to the original. Citizens of Schengen countries must send a ‘card of insurance’ with their visa application. For some types of visas and for citizens of some countries, consulates may demand additional documents. You should pay the consular fee to apply for a visa. The cost starts from 35 euros, and depends on the type of visa and on your citizenship. International tourists entering by ferry via several ports (Kaliningrad, Sevastopol, Saint Petersburg, Vladivostok and some others) are able to stay in Russia visa-free for up to 72 hours, if they spend the night on-board or in a space, approved by the travel agency. Cruise passengers may leave the ship without a tourist visa only for tours organized by cruise or other authorized tourist companies. When departing, make sure you have a copy of your Russian visa registration, otherwise you may be fined. You can read about visa registration in the Travel tips section on our site.